 Calling itself a "Rotisserie-Extraordinaire," Rib ROom is an upscale yet casual restaurant that has been a favorite for both locals and tourists for the past 35 years. 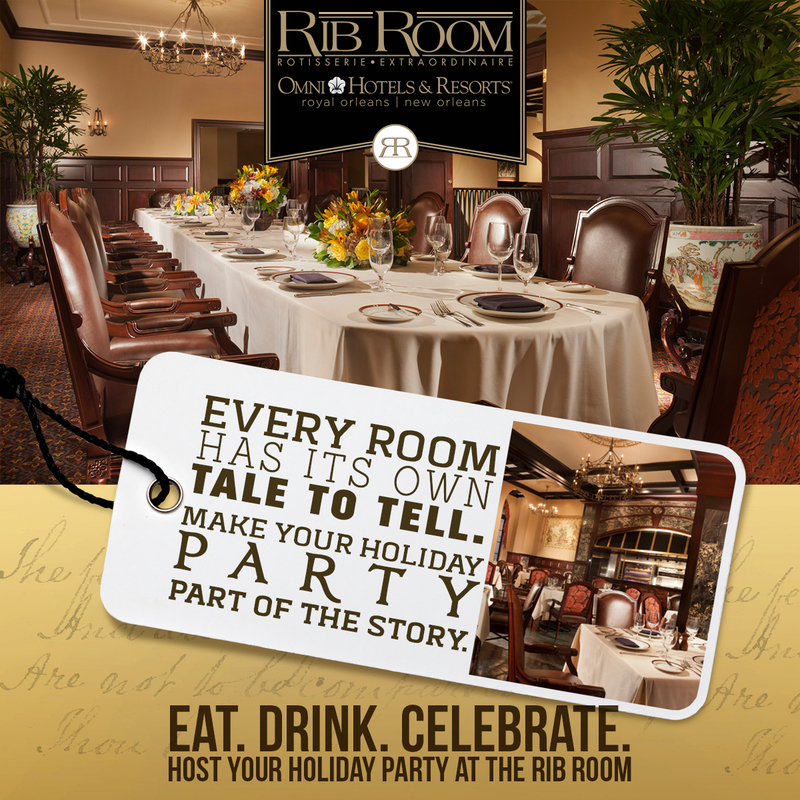 The Rib Room has a casual atmosphere and is usually filled with business people taking a break. 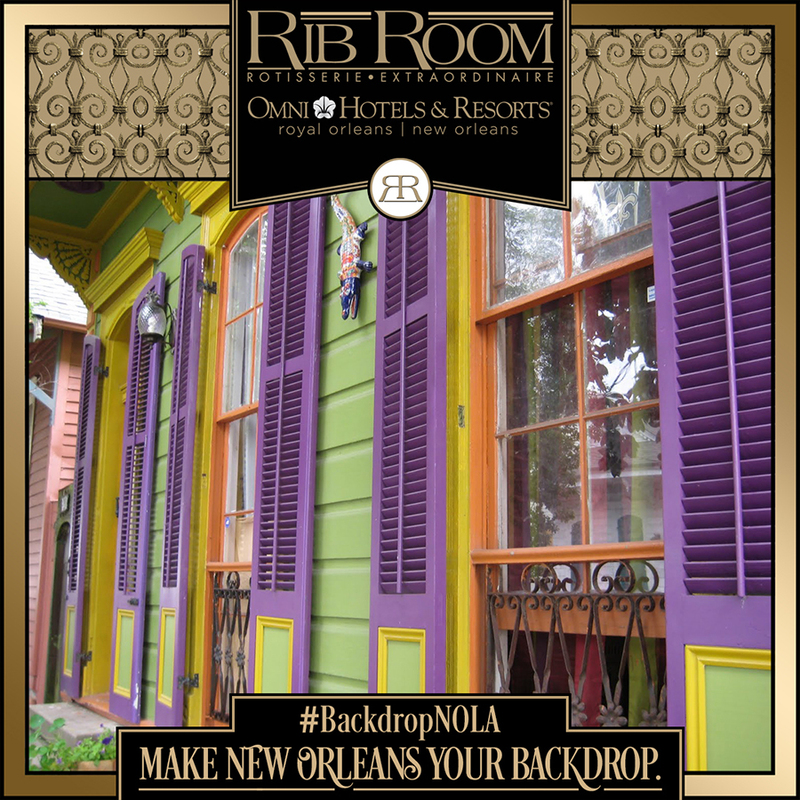 It is best known for its slowly roasted prime rib and Creole classics. 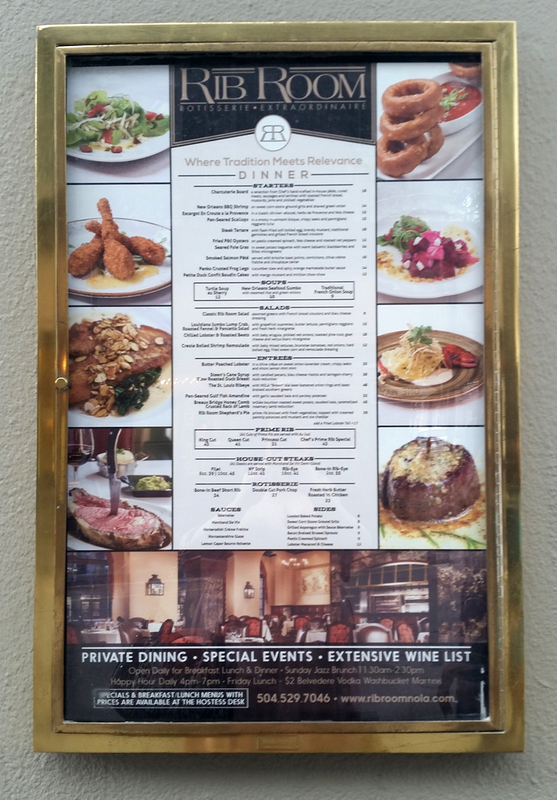 Its history is stacked with business deals arranged over a delicious meal at the restaurant where downtown businessmen enjoy martinis and makin' deals. 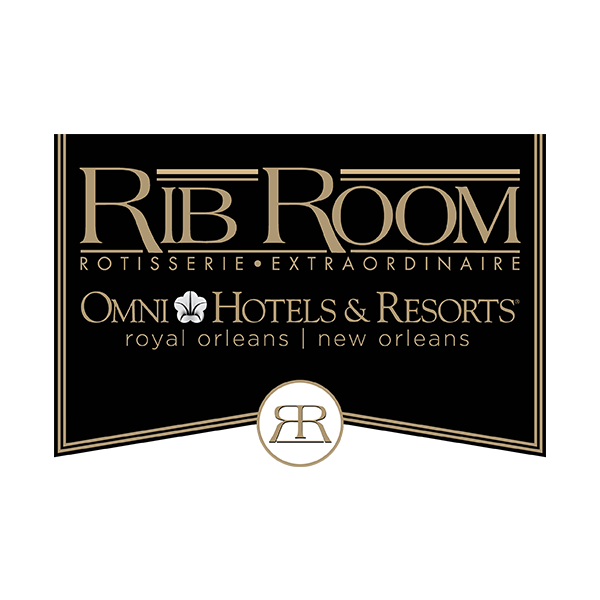 Located inside the grand Omni Royal Orleans Hotel, formerly the St. Louis Hotel, the Rib Room is a highly regarded restaurant on the corner of Royal and St. Louis Streets in the French Quarter of New Orleans. 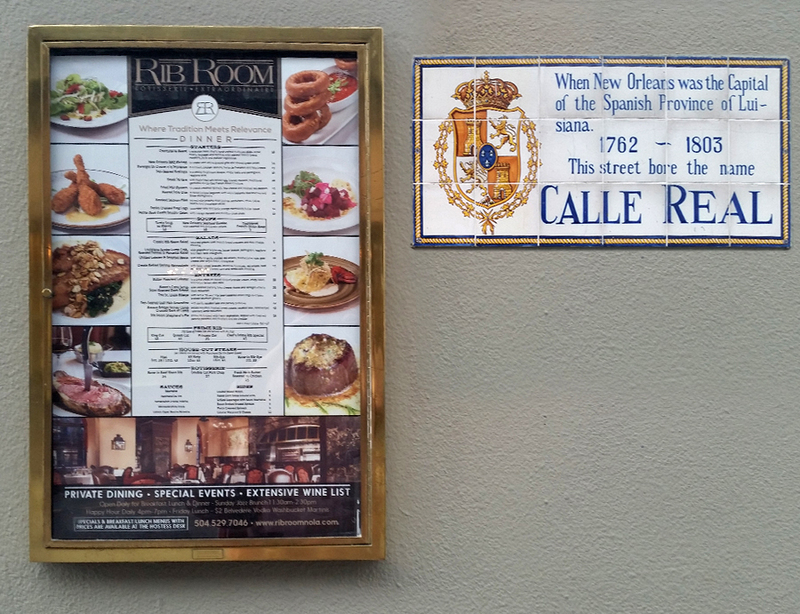 This busy thoroughfare is in the heart of the historic neighborhood and thousands of passersby walk along the exterior of the restaurant where a large menu is posted daily to promote the seasonal dishes and chef specialties. 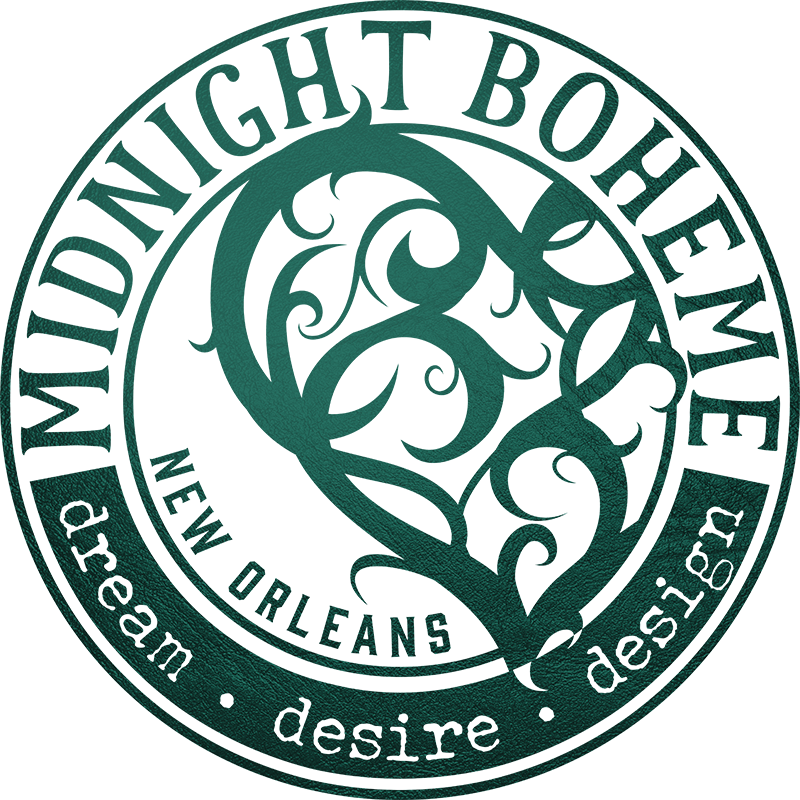 Since 2015, Midnight Boheme has had the privilege of creating this poster design and keeping it updated as the seasons progress. 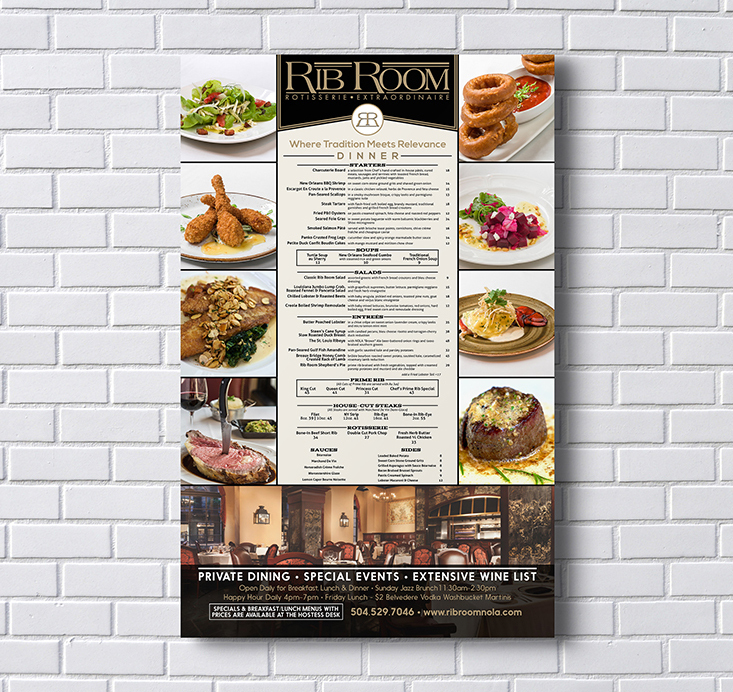 Featuring excellent food photography provided by Zydeco Media, Midnight Boheme's design of the poster for the Rib Room dinner, lunch, breakfast and brunch menus represent the delectable cuisine offered at the restaurant. 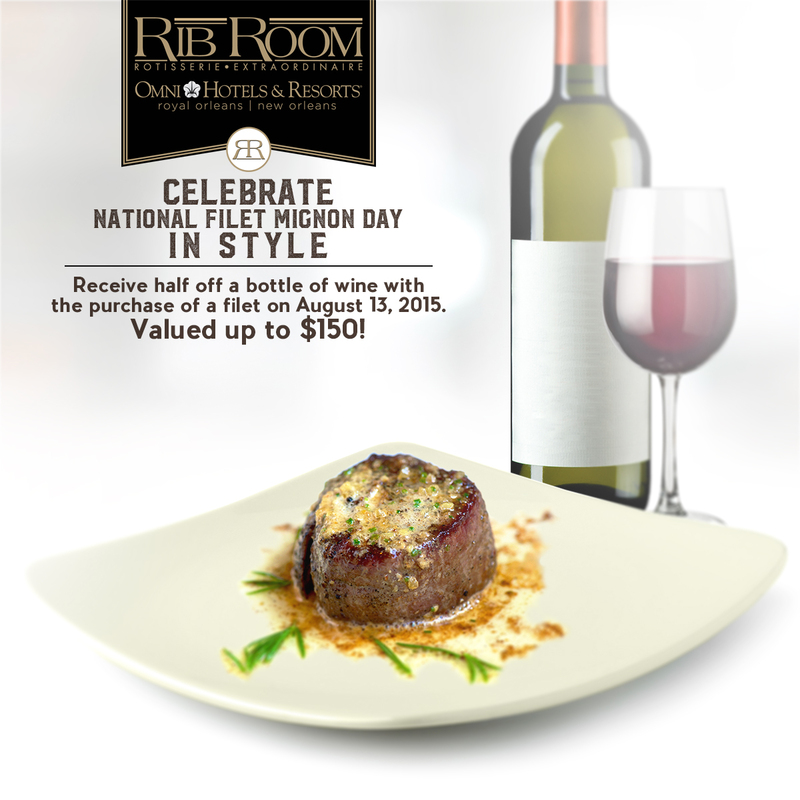 From prime rib to filet mignon, from oysters Rockefeller to pecan pie, the Rib Room menu makes the mouth water! 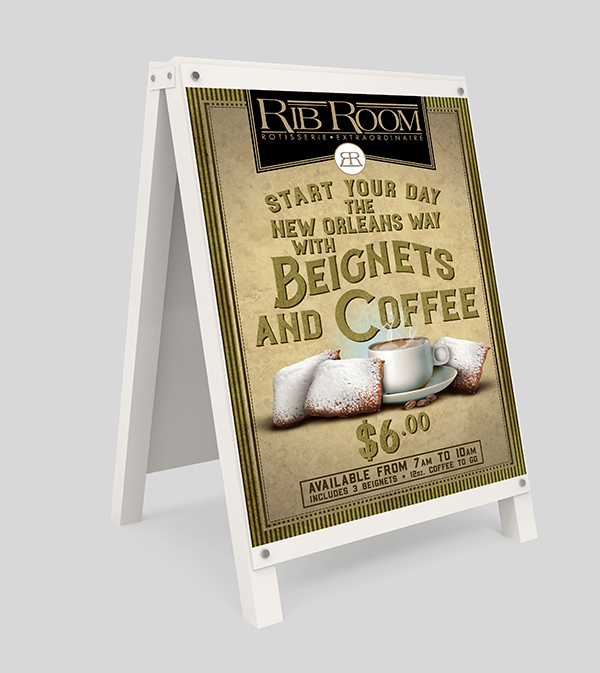 During the month of December, New Orleans restaurants offer a special prix fixe menu called the "Réveillion." 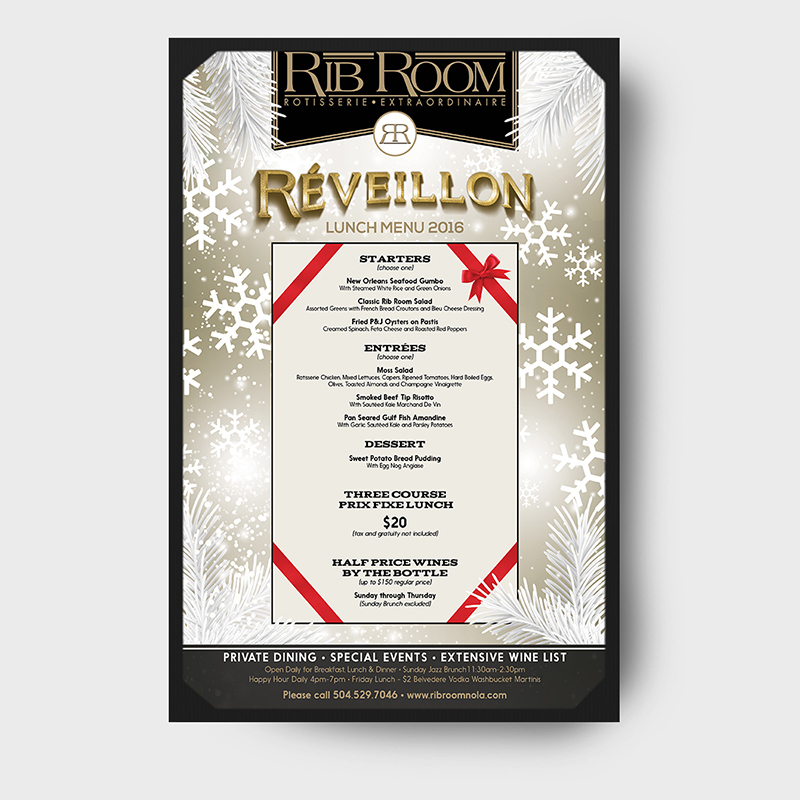 Traditionally, a Réveillion dinner is a long feast held by a family the night before Christmas or New Years. 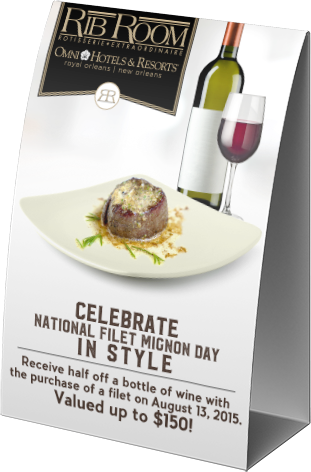 Over the years, it has become a way for restaurants to offer their top menu items in three or four course meal under one fixed price. 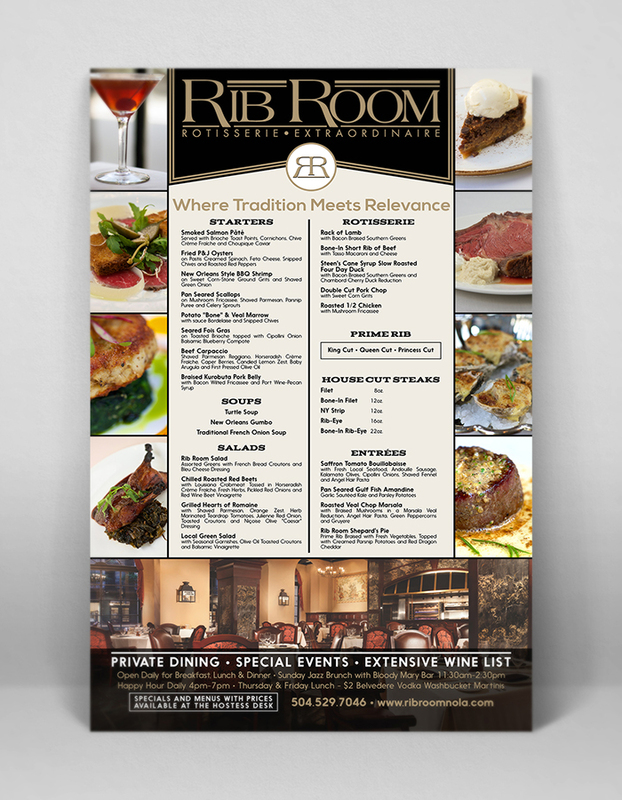 Midnight Boheme designed the Réveillion menu for Rib Room in 2016. 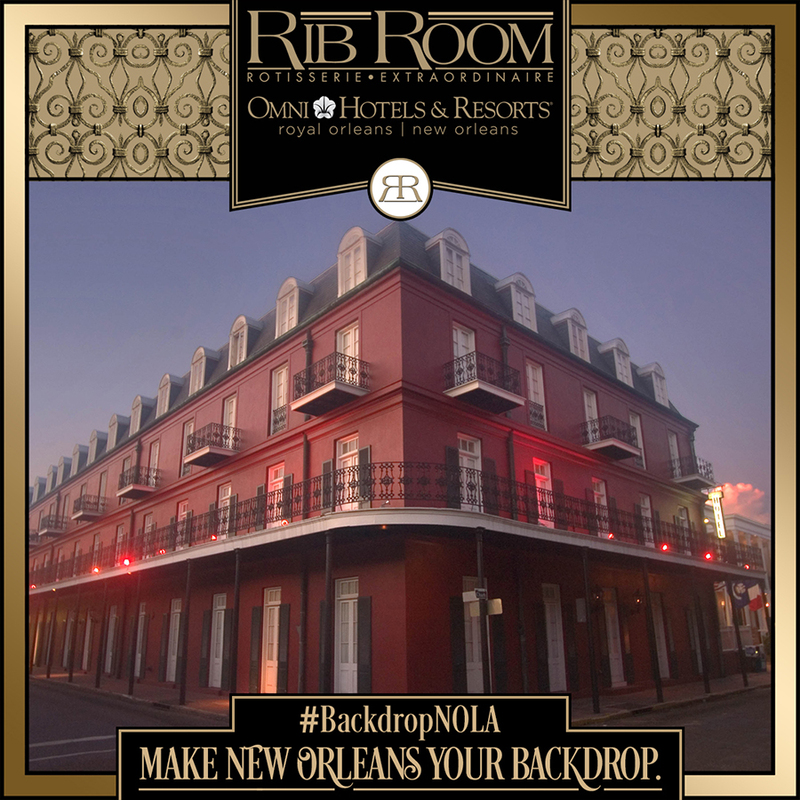 After working with the Rib Room for some years, eventually the Omni Royal Orleans Hotel hired Midnight Boheme to create some additional signage for the hotel itself. 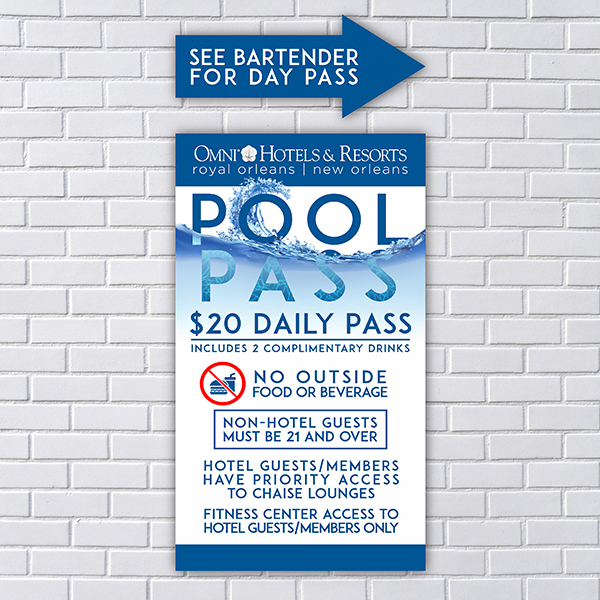 One sign included artwork for the hotel pool offering a special summertime pass for hotel and non-hotel guests directing pool-goers with arrows and attractive signage as they head for a cool dip. 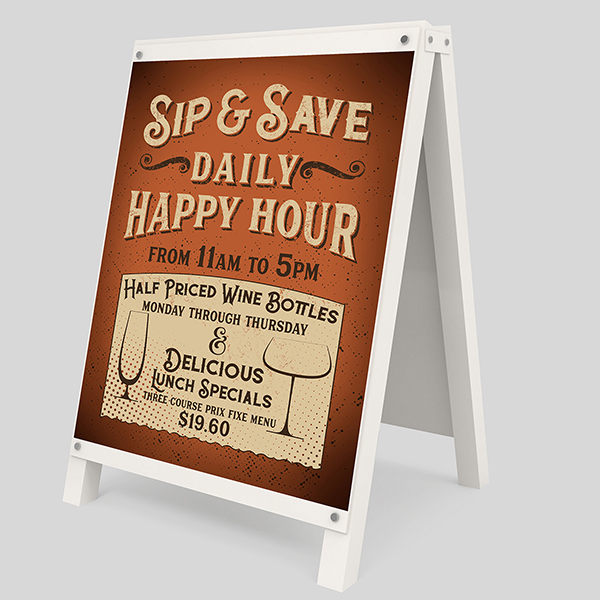 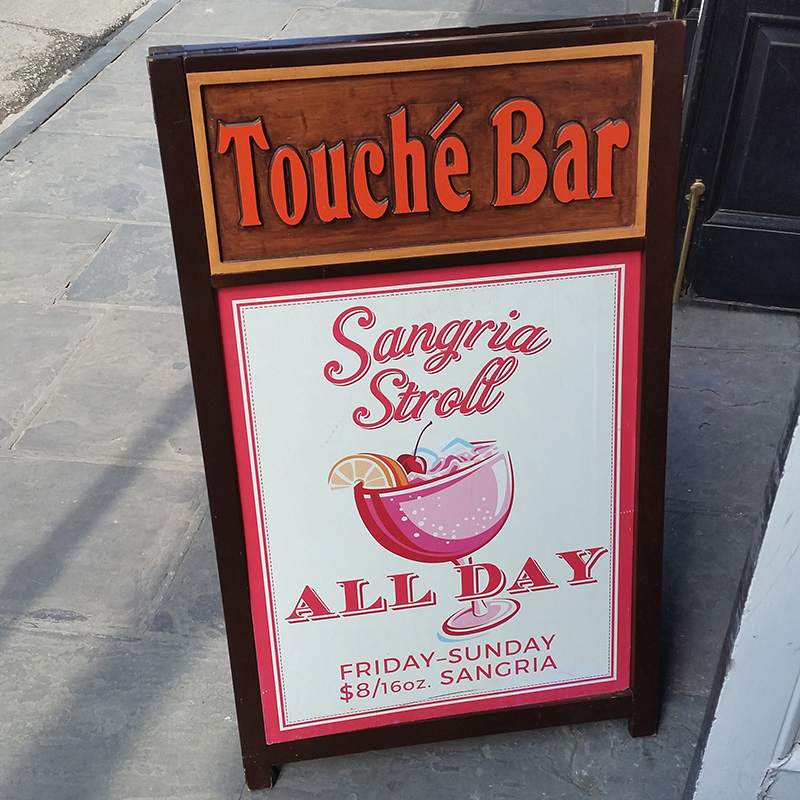 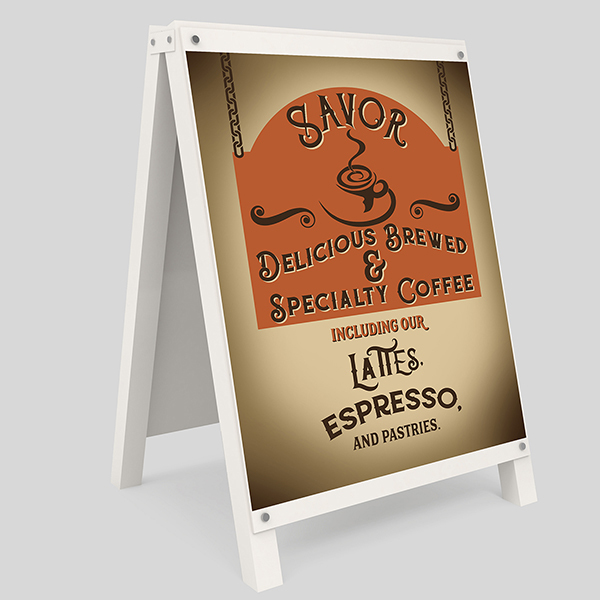 Other signs included exterior sandwich board designs to be displayed on the sidewalk outside the hotel's casual bar "Touché" located along Royal Street. 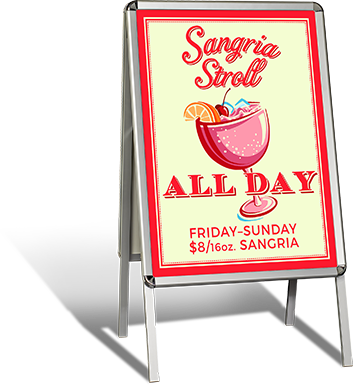 These signs promoted special cocktails and discounted items to bring foot traffic into the cozy bar. 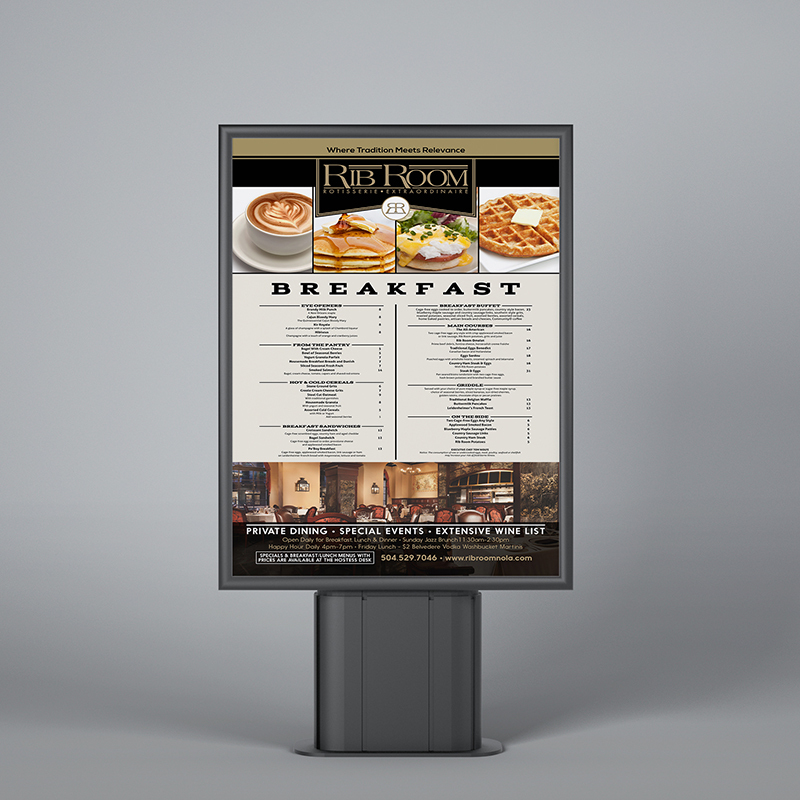 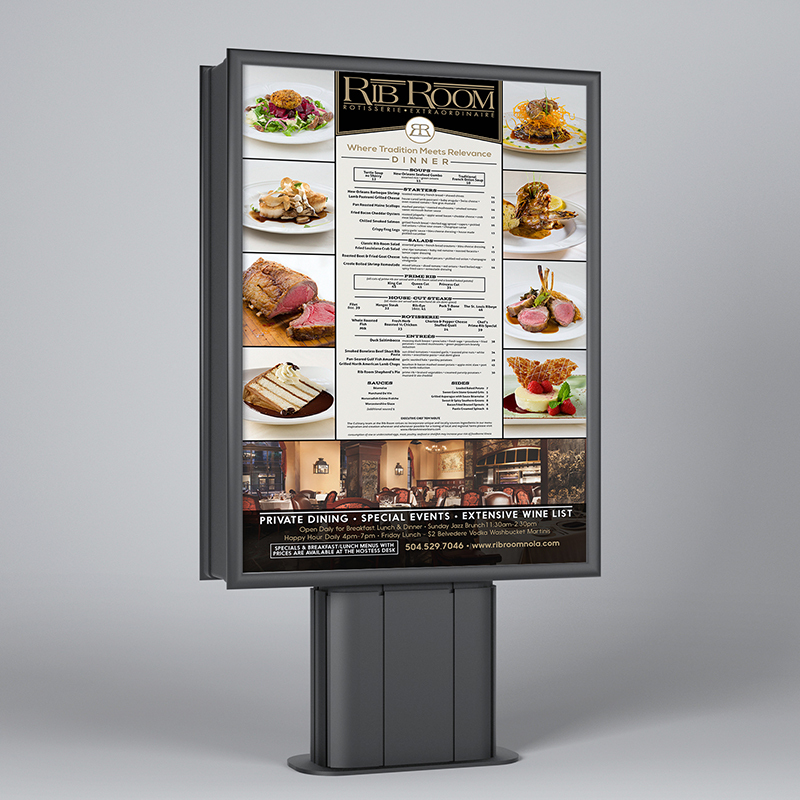 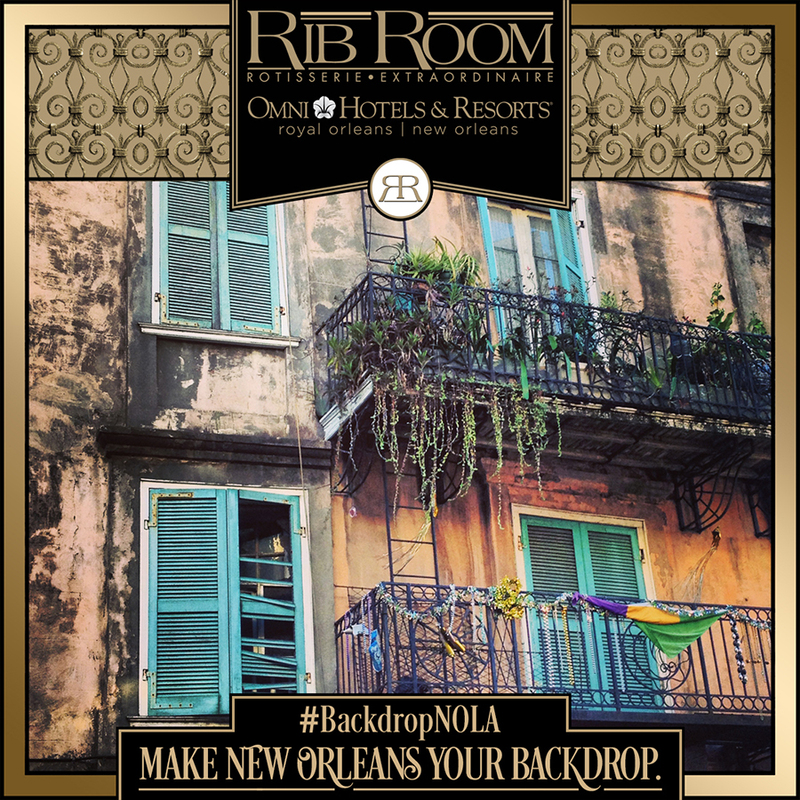 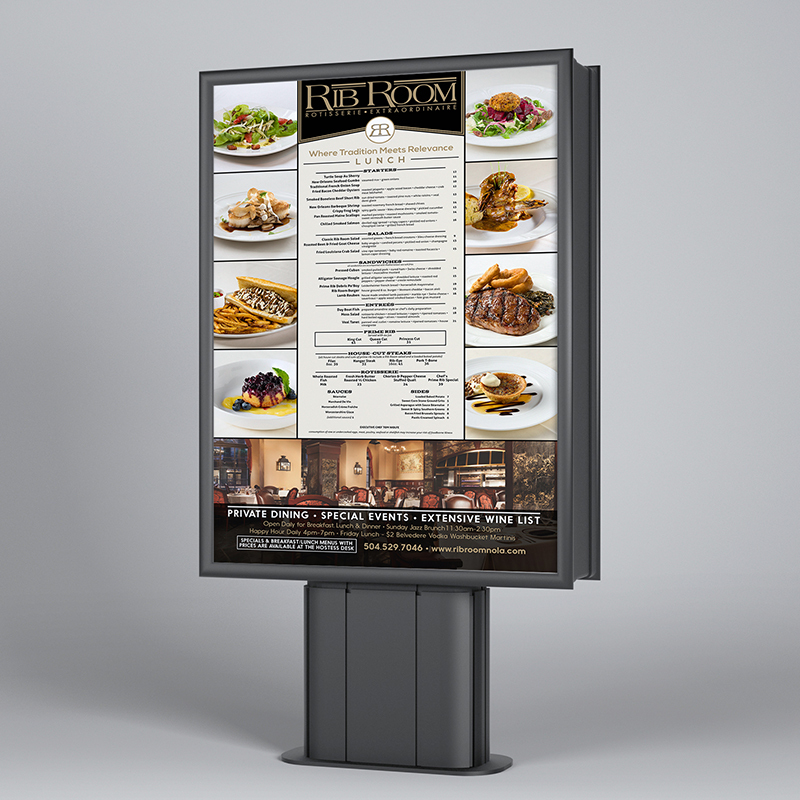 Midnight Boheme also worked with Zydeco Media in creating ongoing social media promotions for the Rib Room and Omni hotel.